A former lawyer dances through hard times. Photograph: Courtesy of Solão Fitness and Dance COSTA EFFECTIVE At right in green, Costa leads a Saturday samba session at Solão. Dill Costa walks right up to me before Cardio Samba, her twice-weekly class at Solão Fitness and Dance. 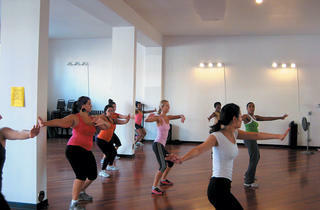 The storefront at North and Western Avenues boasts dance classes in 25 styles geared toward exercise. (For more cardio-dance options, see page 26.) I give Costa my name, as requested, and the Rio de Janeiro–born dancer and singer responds with a huge smile and a hearty, accented “Welcome!” Seventeen women and I spread out on the studio’s wood floor. 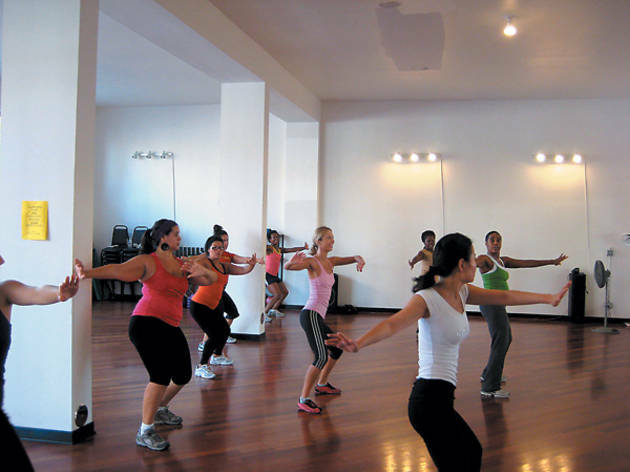 The 75-minute class starts easily enough, with simple marches and ball-changes to sunny music obviously from across the equator. Costa doesn’t wear a headset and the room has a somewhat nasty echo; locking my eyes on her Lycra’d hips and sneakered feet helps me keep up. Within minutes, I’m sweating buckets. Costa makes jokes and yells encouragement more often than she gives corrections, although she does sidle up next to everyone at some point. “Joo’wanna go to Bahia?” she asks as we huff, puff and shake our asses double-time. She trots over to the sound system and cranks up the volume. “Maybe you tell your hoosban’ yoowanna go to Bvrazeel. Maybe you don’wanna come back!” By the time we end class with a dancerly reverence (curtsy or bow), I’m completely pooped—and grinning from ear to ear. Fisher’s had as much good luck since as bad before. About 500 people pass through Solão’s doors each week; Fisher expects her new, three-studio facility two blocks north to be ready for move-in by the end of this month. It’ll add showers, lockers, a snack bar and child care. Projected increases in volume will keep rates at their current levels—monthly memberships starting at $59 or $15 per class, with discounts available through punch cards and package deals—if not lower them. At John Marshall, Fisher befriended a Brazilian classmate, which launched a love of that country’s culture and led her to Portuguese classes at the Lincoln Square school Brazil in Chicago. Fisher thought to add samba to Solão’s schedule. (“Honestly,” she says, laughing, “a lot of classes we offer are things that I want to learn more about.”) Her calls for teacher suggestions received the same, emphatic response: “Hire Dill Costa,” who’d developed a fiercely loyal following at the Old Town School of Folk Music. Solão Fitness and Dance is at 1616 North Western Avenue and online at solaofitness.com.